He was granted two weeks paternity leave from work, and during those early days, we shared the duties of caring for our new baby equally. In fact, I didn’t change a single nappy for the first four days of bub’s life! We had visitors galore wanting to meet the newest addition to the family, so my husband took it upon himself to vacuum, put on load after load of washing and generally keep the house in order, while I received guests from our couch like some latter-day Queen. All too quickly, though, it was time for him to return to work. And while I had prepared myself (as much as one can) for what caring for a baby full-time would be like, I hadn’t stopped to consider the other obligations that would come along with being the stay-at-home parent. Fold the washing, mop the floors, strip the beds … Oh, and feed, change and settle the baby. My daily to do list was in stark contrast to the “update spreadsheet, attend meeting, return client calls” – type lists I’d been ticking off only a few months prior. Having survived the newborn phase and with my son in a workable routine, the days quickly took on an unchanging rhythm, filled with a laundry list (no pun intended) of chores that seemed never-ending. I puzzled over how our home could suddenly require so much … upkeep. I couldn’t recall doing this much washing/cleaning/cooking when I worked full-time. It suddenly dawned on me what was going on here – my husband had, oh so subtly, without fanfare or pre-announcement, started to dial back his contribution to the household chores. Granted, he’d had to increase his hours somewhat due to a big project at work, but I was shocked at how seamlessly we had both slipped into our gendered roles in such a short time. I was a fierce feminist, wasn’t I? Didn’t both my husband and I champion gender equality and equal rights for women? Yet, here was hubby, the designated “breadwinner”, going off to work each morning and returning by 6pm every night to a home cooked meal and a clean house, while I seemed to be channelling Betty Draper. Well, Betty Draper without the hired help and a penchant for chain smoking. Last month, the University of Melbourne released the long-term HILDA (Household, Income and Labour Dynamics in Australia) study, which revealed that while Australians’ attitudes towards parenting and work are becoming less traditional – with fathers taking on far greater childcare responsibilities – these progressive attitudes don’t seem to extend to housework. Women still do seven hours more housework per week than men and, according to calculations by one of the report’s co-authors, Inga Lass, it will take another 30 years before both genders do the same amount of household chores. 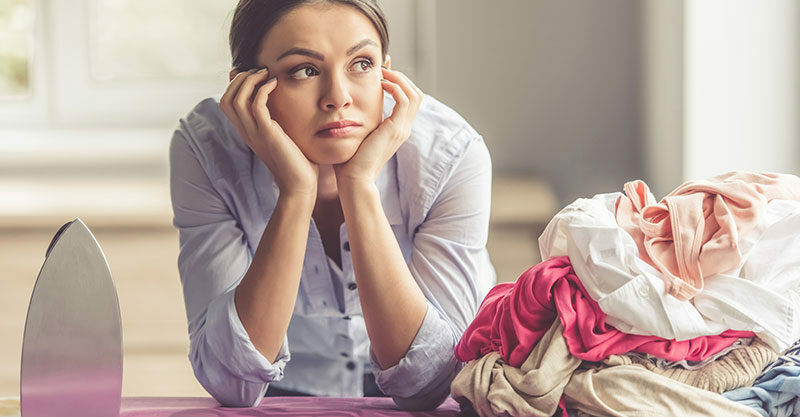 “HILDA shows [that] most women feel overburdened by household chores, while most men think they do their fair share,” Lass says. And who does the most housework out of any group surveyed? Married women with children: they clock up almost 30 hours of housework per week. Breadwinner versus stay-at-home parent: Who wins? As I continued to struggle with my new job description – mother and … well, what felt like “unpaid domestic servant” – I questioned whether my husband and I were merely perpetuating gendered stereotypes. Or as the stay-at-home parent, did it just make sense that the home front becomes my dominion for the time being? Chores, childcare and all? Had I chosen to go straight back to work after the birth of our child, my husband would’ve helped facilitate this by adjusting his own work commitments. But as a couple, we had decided I would devote the full year (possibly more) to our son. Really, isn’t that what true, equal partnership is all about? Each partner giving and taking, leaning in and out, as the family as a whole requires it? For both parents, there are benefits and downsides to the breadwinner and stay-at-home roles. My career may currently be on hold, and I may struggle with feeling like the only thing I’ve accomplished all day is to empty the dirty washing basket, but on the other hand, I wouldn’t trade the days I get to spend with my son for anything. Meanwhile, my husband misses out on huge swathes of time with our bub while commuting and working full-time. However, his career is progressing unimpeded by family commitments. Ultimately, my little one will be off to kindergarten, and I’ll be returning to full-time work before I know it … and that’s when I’ll be calling on my husband to revert to our previously equal division of those pesky household chores. We want our son to grow up a feminist after all!